Over the past year, Brazil's President Dilma Rousseff has weathered waves of criticism over government fraud, financial mismanagement, and bloated public spending on infrastructure projects for mega sporting events like last year's World Cup — and the outlook hasn't improved since her narrow re-election last October. 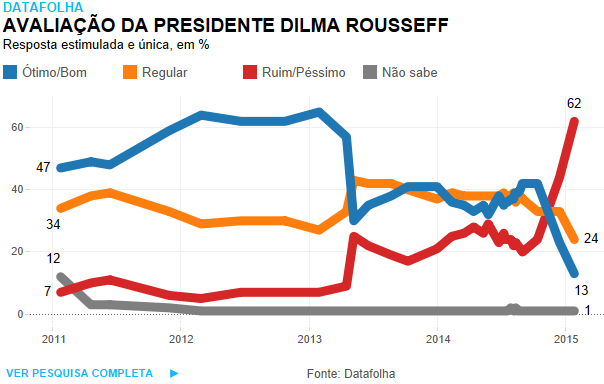 A sagging economy and the biggest corruption scandal to ever hit the country have pummeled Rousseff's popularity to its all-time lowest level, according a Datafolha poll released on Wednesday, with 62 percent of those surveyed describing their assessment of the president as "bad" or "terrible." Only 13 percent thought highly of her. The poll of nearly 3,000 people was conducted after hundreds of thousands of Brazilians joined anti-government protests across the country on Sunday — police estimates put the number even higher. Not since the impeachment of Fernando Collor in 1992 has a Brazilian president faced such wide disapproval. Video footage from above shows thousands of people swarming Avenida Paulista in São Paulo, Brazil's largest city. Demonstrations demanding Rousseff's impeachment quickly followed her electoral victory, and have grown to become a fixture of the country's turbulent political scene just three months into her second term. "Fora, Dilma!" ("Get out, Dilma!") is a characteristic refrain. Surreally, her nationally televised addresses have been accompanied by the discontented clattering of pots and pans in so-called "balcony protests." Video footage of a balcony protest in action. After the budget profligacy of her first term, Rousseff's promotion of unpopular austerity measures aimed at reducing the deficit and improving fundamentals has cost her considerable support — particularly among the country's poorest voters, who traditionally side with the president. Rousseff had pledged to revive Brazil's stagnant economy, which dipped into recession last year, but not at the expense of the working classes. Maria do Socorro Braga, a political scientist at Brazil's Federal University of São Carlos, told VICE News that few were prepared for the abrupt spending cuts and tax hikes that are being pushed by her government. "They have turned their back on Rousseff over the financial adjustments and joined the middle and upper classes in their anger over the lackluster performance of the economy and corruption scandals," she said. The protests against her administration have swelled as a result. "We won't tolerate any more injustice! Politicians are getting away with crimes scot-free," a São Paulo university student named João Alonso Tonelli told VICE News at Sunday's rally. "Enough is enough. We need a change." "I'm outraged and ashamed with the state of the country," added Maria Tereza Ribeiro, a 65-year-old housewife who was demanding the removal of the president's Workers' Party (PT) and its coalition allies. "It's all because of our filthy politics." A public opinion survey during Sunday's protest found that nearly half of those in attendance were there to march against rampant corruption. State-run oil giant Petrobras, Brazil's biggest company and a major source of government revenue, is reeling at the center of Operation Lava Jato (Car Wash) — an investigation into a sprawling kickback scheme in which prosecutors allege that a portion of the proceeds from inflated contracts between Petrobras and construction companies were funneled to the PT and its allies. The exact amount of the misappropriated funds is not yet known, but police have identified suspicious payments totaling some $3.7 billion. Dozens of executives have been arrested since the scandal began to unfold last March; several remain in jail. A growing number have signed plea bargains, spilling details of the scheme to secure lesser sentences. Now Brazil's Supreme Court has authorized investigations into senior politicians — including acting congressional leaders and former ministers and chiefs of staff, all but one of them linked to Rousseff's governing coalition. Though Rousseff served as energy minister and chaired Petrobras's board of directors while much of the graft allegedly took place, she denies being aware of the scheme. But the investigation has lately come uncomfortably close to her government: on Monday, PT treasurer João Vaccari Neto was formally charged with corruption. Rattled by the latest protests and keen to restore her reputation, Rousseff delivered a package of anti-corruption measures to Congress in a televised ceremony on Wednesday. "This is a decisive step to increase the government's ability and power to prevent and fight corruption and impunity," the president said. The new measures include criminalizing political slush funds, seizing the assets of corrupt officials, and strengthening the government's Ficha Limpa (Clean Record) law, which bars those with criminal records from holding elected office, to include all appointed officials. But Carlos Pereira, a political scientist at the Getúlio Vargas Foundation in Rio de Janeiro, believes Rousseff's efforts may prove to be too little too late. "The measures are good, but everything announced has already been discussed in Congress," Pereira told VICE News. "Their actions, adopted under pressure, look timid. To regain their credibility they'll need to take tough actions. There are people convicted of corruption who remain working in government." "They need to show they are serious by expelling corrupt members and putting an end to double standards," he added. Despite her government's implication in corruption, Rousseff has argued that her administration should be credited with championing initiatives that have thrown corrupt politicians in jail. Braga agreed that the president should be applauded — albeit cautiously — for pursuing a package of reforms against malfeasance. "They're seeking solutions and heading in the direction the country is urging, but we'll have to see these measures working to evaluate their effectiveness," she noted. "Many in Congress aren't interested in seeing them progress."